let the two first frets neerest the head of the instrument (being the greatest) be of the size if your countertenor, then the third and fourth frets must be the size of your great meanes: the fift and sixt frets of the size of your small meanes: and all the rest sized with trebles. These rules also serve for viols, or any other kind of instrument whereon frets are tyed. So the first two frets should be the same size as the fourth course (perhaps about .75mm), the third and fourth the same size as the third course (about .60mm), the fifth and sixth the same size as the second course (about .50mm) and the rest the same size as the trebles (about .40mm). 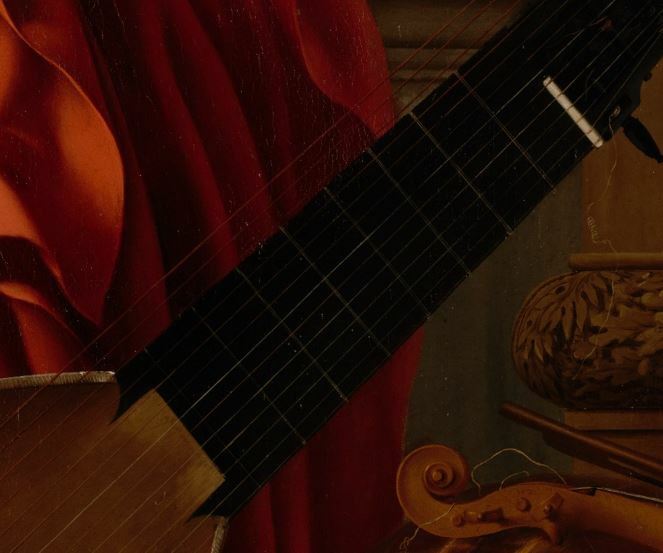 Of course we don’t know exactly what sizes of string Dowland would have used for various courses, but one thing we can be sure of is the sizes of frets were very thin by modern standards, and this is backed up by the iconography. It is also important to note that these instructions do not imply the use of exactly the same diameter for the first and second fret, another size for the third and fourth fret, and so on. A bundle of strings for a particular course would have contained a variety of diameters, some thinner and some thicker, so with careful selection it would be possible to have a finely graded succession of frets which got progressively thinner as you go up the fingerboard. To chuse your B fret, so thick as well you may, (according to the lying of your nutt, and strings;) For the thicker that fret is, the more easily may you fit all the rest: because that in fretting, every next lower [we would say higher] fret, would be some small matter smaller, than the next above, (quitethrough:) yet this rule is not observ’d by most, who are careless; so that oftentimes, their instrument jarrs, and sounds unpleasantly. 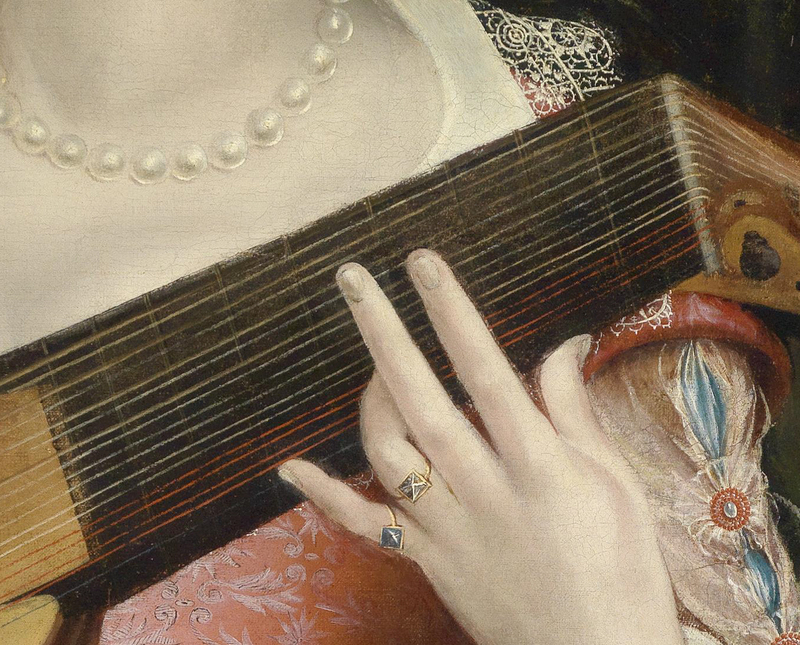 There is a way which I have lately try’d, and I find it much better, which is, to fret a lute with single strings. My reason is, because it is not only sooner done, and with a shorter string; but chiefly, it does (assuredly) cause a clearer sound from the string stopt; which must needs be granted, if it be considered, that the string lying upon this only round single fret, cannot but speak clear, when as (on the contrary) it lying upon two, (as in the double fret it does) it cannot be thought to speak so clear, because, that although it lie hard and close, upon the uppermost of the two [i.e. the strand nearest the nut], next the finger, yet it cannot lie so close and hard, upon the undermost; so that it must needs fuzz a little, though not easily discern’d, and thereby, takes off something of it clearness, especially if the fret be a thick-broad-double-fret. Mace hits on the main problem which will strike you if you try double frets. Because the two strands are exactly the same size, the string will tend to bear more strongly on the strand nearest the nut, and perhaps even buzz against the other strand. But because the strand nearest the nut receives more wear and pressure from the stopping finger it very quickly gets squashed a little flatter and this problem soon disappears. You can even encourage it by rubbing it with the back of your nail. Once the frets are bedded in, they provide a greater surface area in contact with the string than a single fret and this may make playing ornaments and slurs easier because there is less tendency for the string to be pulled sideways across the fret. There is also a suggestion that it may improve the sound, presumably again by virtue of having a greater contact area. They also have less tendency to slip out of position than single frets. Some modern writers have argued that having thin frets allows you to get a better (lower) action by getting the strings closer to the fingerboard. Personally I can’t see how this can be true because the action is determined by the angle of the strings to the plane formed by the top of the frets – if this angle is too low, the strings will buzz against one or more frets. The lowest possible action is achieved by using the thickest possible fret at each position, starting at the nut and ascending, following the same rule, one fret at a time. If the nut is low, then the frets will be thin. If the nut is high, thicker frets will be needed, but the height of the strings over the frets will be the same. Whether the frets will need to be graded in size depends on the angle of the neck to the body of the lute. Ideally this angle will be low enough that the frets need to be graded in size to match the parabolic curve of the vibrating string, but this also depends on whether the fingerboard is completely flat or (as it should be) slightly concave from end to end. 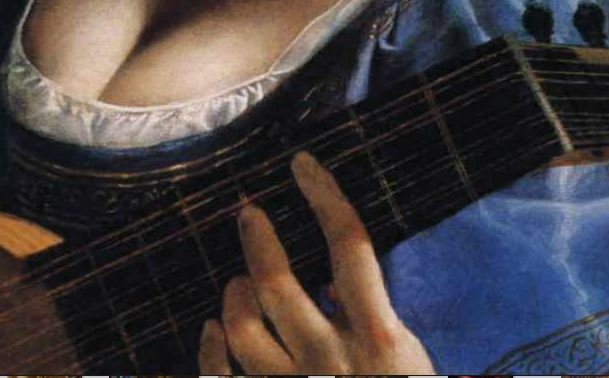 It has also been claimed that having thin frets, because it means greater pressure of the finger on the wood of the fingerboard rather than the fret itself, makes it easier to play ornaments – but I have heard modern lutenists say exactly the opposite, that if the fret is too thin the finger has to apply more pressure than is strictly necessary to hold the string. It may depend on how fleshy or bony the ends of one’s fingers are! ‹ A Recercata possibly by Francesco da Milano? Enter your email address to subscribe to the Luteshop blog and receive notifications of new posts by email.